Glaucoma testing consists of several components. We measure the eye pressure which is usually increased in glaucoma. We also utilize an instrument call the ORA which measures corneal hysteresis which measures a biomechanical attribute of the cornea which also helps us evaluate for glaucoma. Two other extremely important tests are the OCT which measures retinal and optic nerve damage which indicates glaucoma and also the Humphrey threshold visual field instrument which is very important both for testing for glaucoma and following patients undergoing glaucoma treatment to make certain the disease is not progressing in spite of therapy to lower the eye pressure. Have you had an eye exam to check for glaucoma? Book A Glaucoma Evaluation Now! A glaucoma test is part of our routine eye examination. We measure the internal eye pressure, test the peripheral visual fields, and examine the optic nerves during each examination. 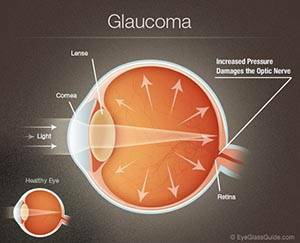 In glaucoma the eye pressure is usually elevated, the optic nerve has structural changes, and there may be a loss of peripheral vision. If we see any signs of potential problems with these tests that suggest glaucoma, we then perform additional tests. We would then run a threshold visual field test which is a more sensitive test looking for early vision loss indicating glaucoma. We then also use our Cirrus 5000 OCT which is an extremely powerful way of detecting early signs of damage from glaucoma. The OCT utilizes advanced technology to look for changes in the retina and optic nerve that is important in detecting and monitoring glaucoma. The OCT is a non-invasive test that only takes a few minutes and uses light beams to give a detailed analysis of your eye. People almost never notice any problems in the early stages of glaucoma. Usually, the disease is fairly advanced before people become aware they have a problem. Our goal is to detect this problem early and keep it under control. You can not cure glaucoma but we strive to control it with medications to prevent permanent vision loss.